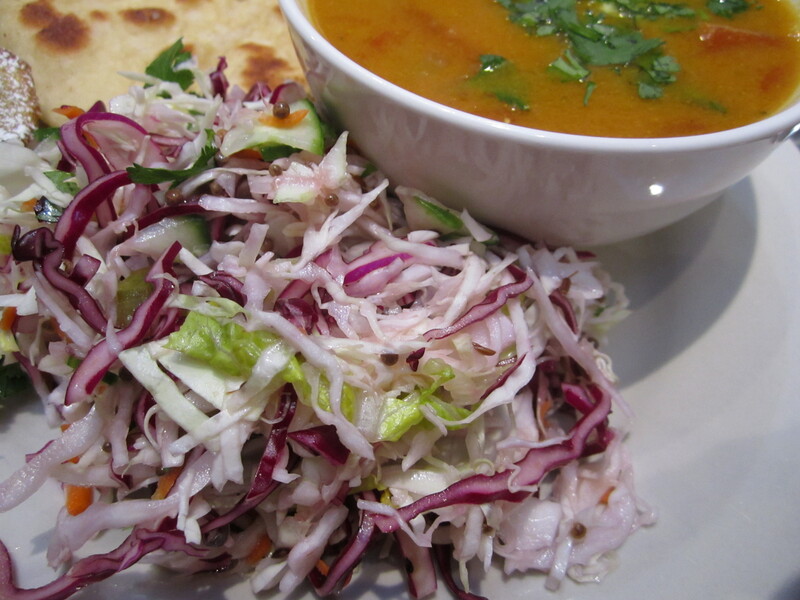 To go with the Indian theme of the Tomato and Red Lentil Soup, I found this Cabbage Slaw recipe in this month’s Cooking Light magazine. I thought it was a great complement to the soup! This is also great on it’s own and was good the next day too. Combine the salad ingredients in a large bowl. Heat a small saucepan over medium heat. Add oil to pan and swirl to coat. Add mustard and cumin seeds, cook 90 seconds or until mustard seeds begin to pop. Remove from heat. Stir in garlic and jalapeno, let stand 2 minutes. Add vinegar, sugar, salt, and pepper, stirring with a whisk. Pour dressing over the salad, toss to coat, let stand 15 minutes.